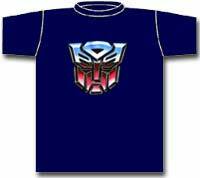 Transformers tee with blue and red Heroic logo. Printed on pre-shrunk, 100% cotton navy tee. Only adult sizes Large left in stock. GI Joe - Cobra transformer logo with Blue, Purple and White color enhancement. Printed on pre-shrunk, 100% cotton black tee. Adult size 3XL. Evil Decepticon logo with blue - purple enhancements. Printed on pre-shrunk, 100% cotton black tee. Only XL and 2X left in stock.